Networked telemetry, radar, and data acquisition equipment offer many advantages in aerospace data collection applications by breaking distance limitations and supporting simultaneous distribution to multiple locations. However, traditional network telemetry systems can suffer from significant interoperability problems. Although low-level aspects of network communication commonly utilize standards like Ethernet and TCP/IP, higher-level standards are missing from telemetry applications. These missing standards include data formats, configuration information, and command/status messages. With each vendor and each user community potentially implementing different high-level interfaces, development costs can quickly escalate when equipment from different vendors must be integrated or when interoperability across organizations is required. 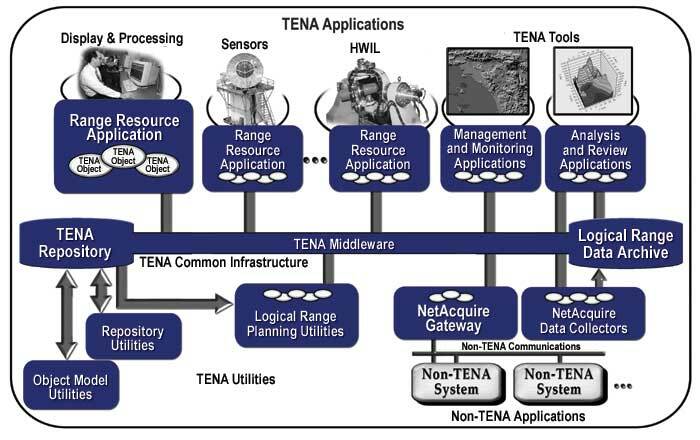 TENA middleware was developed by the U.S. Department of Defense to serve as a advanced foundation for the next generation of network-centric systems. In order to quickly realize the benefits of next-generation network-centric systems, the telemetry community has needed cross-vendor standards, preferably with low-cost, pre-engineered reference implementations. The U.S. Department of Defense Central Test and Evaluation Investment Program (CTEIP) has created a new infrastructure for DoD Test and Training Range interoperability in partnership with the user community. The advanced middleware product is called TENA (Test and Training Enabling Architecture). Pre-engineered vendor-neutral interfaces for common aerospace objects as well as a powerful extension mechanism for creating new interfaces. TENA defines general-purpose objects that represent telemetry – and range – related entities such as radar systems, telemetry feeds, aircraft and other moving objects, and time/space coordinates. For example, a complex operation such as retrieving the real-time coordinates of an aircraft becomes a call to a TENA function such as Aircraft.TSPI.Position(). TENA middleware communicates over any IP network and is available for deployment now. NetAcquire systems are highly re-configurable, real-time telemetry and data acquisition products. Their field-proven COTS architecture dramatically reduces system cost while at the same time providing straightforward, flexible support for almost any type of I/O signal, data format, and real-time data processing requirement. 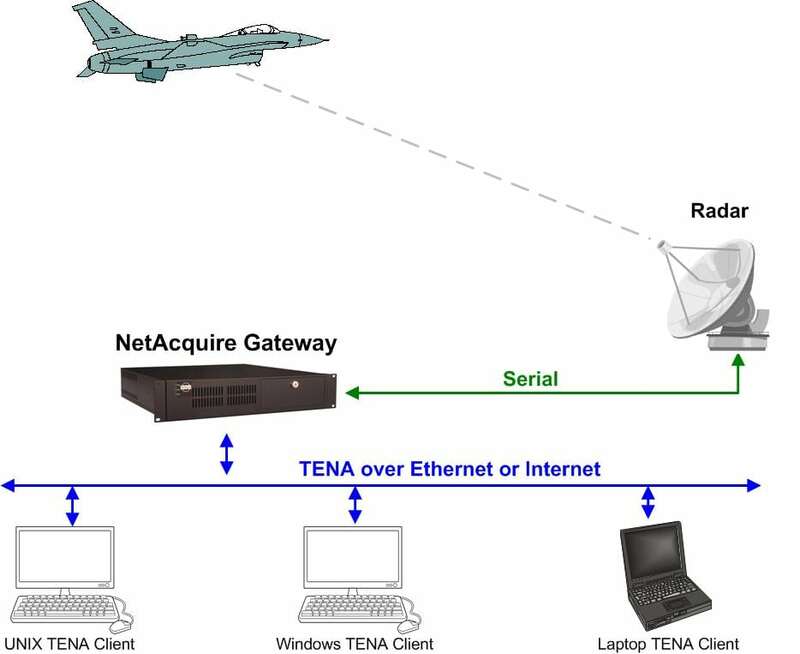 NetAcquire products provide TENA middleware with the real-world interfaces necessary to implement a wide range of TENA-compliant solutions and NetAcquire products are all available with a pre-installed TENA middleware option. NetAcquire products also run a true real-time operating system, which in turn allows TENA to run in guaranteed real-time. This support for low-latency, deterministic system operation opens the door for TENA deployments into the widest possible range of mission-critical aerospace data collection applications. Most mid-generation radars lack network capability, requiring communication using legacy serial data protocols and limiting interoperability. NetAcquire systems provide built-in synchronous serial and digital interfaces for directly connecting to almost any existing radar. Serial data from the radar is ingested, converted into appropriate user coordinates, and published onto any network using TENA.